As the owner of approximately 100 scarves and hats of varying color, shape and consistency that my grandma has knitted for me over the years, I know gifts from grandparents are priceless, perfect treasures. Even if they aren't always exactly the gift you might have chosen for yourself. Like this "shark blanket" which a grandma knitted for her grandson. 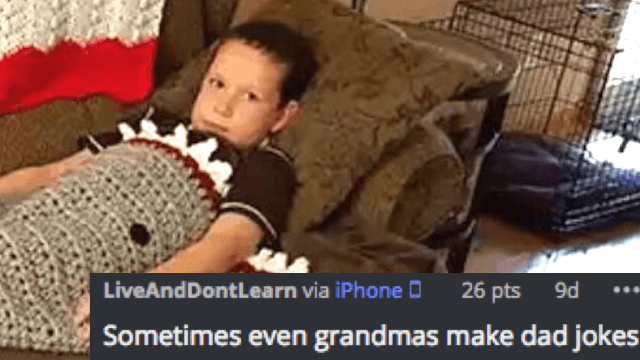 A photo of the kid wearing the blanket was shared by Imgur user newrapson and is going viral thanks to one hilarious, probably-accidental detail. Yes, yes ,it does. Ha ha, good one, Grandma! Some commenters seem to think Granny was in on the joke. Or maybe she noticed her mistake, but figured her grandson wouldn't. And others just have major blanket envy. I mean, awkwardly placed "fin" or not, it is an AWESOME blanket. This kid is lucky his grandma cares enough to make it for him. Even if this photo going viral could easily be his worst nightmare. Hey, at least he'll always have a fun story to tell at parties! Flash forward to high school when he's known as "shark boy" and every girl in school wants him to take her to prom.